What is the purpose or benefit of knowing the houses in astrology and which house your Moon is in at any given time of the month? 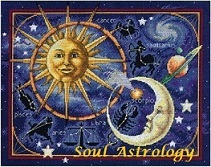 Divination and Divine Timing — to know astrology is to have a handle on that, as least to some extent. Yes, the Moon moves quickly and goes through each house once a month. What is a house? It’s an area of life. And the Moon relates to our sense of happiness, feelings of security. If we work in harmony with astrology, we know ourselves and what times of the month are typical for particular feelings to surface or to be more prominent or prevalent than other times. Why not work with that knowledge—be in cooperation with the natural energy of the Moon and the Psyche and Life Itself? Examples? Why try to deal with money issues when the Moon is in your 11th house? You natural inclination would be to perhaps visit with friends or do other 11th house things. Suppose you have a health issue and you want to know what day this month would be good to make the doctor appointment? When the Moon transits the 6 house would be typically the best time because the emotional/feeling nature will be in harmony with that. I found this system valid for myself when beginning to notice one time of the month—every month—when I wanted to just disappear and not speak to anyone! Whenever this happened, this feeling, I’d look to see where the Moon was. Each and every time it was in my 12th house. Yeah, I began to see a pattern. So why not work with it more consciously? 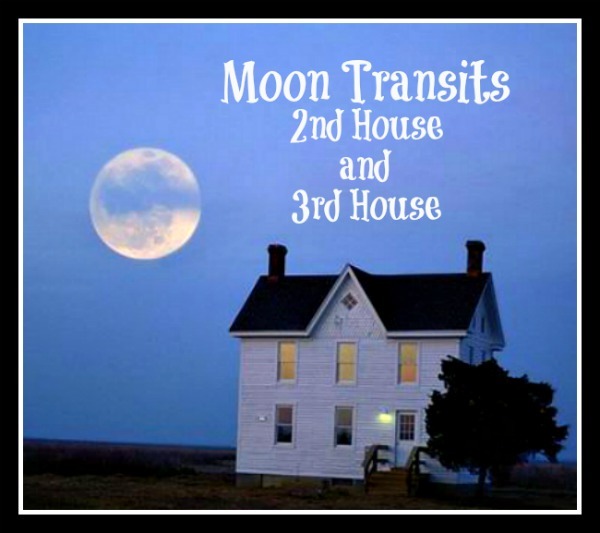 Thus, my reason for these posts on the Moon’s monthly transits through the houses! Now that the method behind this madness has been revisited, my 2nd and 3rd house have recently had a visit from the transiting Moon. We look first of all to the archetype of the house itself. The 2nd house (ruled by Venus and Taurus) relates to money, what is valued, self-worth, self-reliance and the 3rd house (ruled by Mercury and Gemini) relates to communication, conversation, left brain activity, thinking, business, short trips, correspondence, neighbors and siblings. As mentioned in the previous post about the 1st House, there are other influences affecting how that Moon is going to express—namely, the other planets and signs in your particular house and aspects the Moon may be making to other planets in the chart. But let’s stick with the basics for the purpose of this blog post. When the Moon transits through your 2nd house, it’s a good time to pay attention to money concerns and where you stand with your monthly budget. If you deal with that, you will find it to be very satisfying and boost your feelings of security. This is a good time to come up with ideas to bring in extra cash as well—the Moon’s energy will naturally be focusing your psyche in this area anyway, so go with it. A 2nd house lunar transit is a good time to review why you are worthy and contemplate what it is you really value and how you offer value to the world—this type of pep talk will enhance your feelings of security and happiness. Review your resources, think of all the opportunities you have to provide for your self and how you are doing so; this, too, will help your mood. Remind yourself how you have proven yourself ‘to’ yourself, no matter what others may think. Think of everything you have achieved and then pay your bills knowing whatever you send out returns to you multiplied—make this the mantra. Personal Note: When the Moon moved through my 2nd house a few days ago, I looked at my own money situation and this is something that is always on the mind anyway. Why? Because my BIRTH MOON is in my 2nd house so this is a life-long consideration for me. My work was busy on the 2nd day that the Moon moved through my 2nd house money came to me from another source as well. What makes you happy at this time? What brings you feelings of security and comfort? Well, it has to do with learning something, teaching something and speaking, finding the voice somehow. You may be sensitive to tones in other people’s voices at this time and the tone of your own voice may be very self-revealing when Luna visits your 3rd house. Your curiosity could be high and you may find that Google is your best friend and your mood would promote research of some kind—data collection. Those things could be very satisfying and the Moon energy would encourage that. Speaking up for yourself, saying what’s on your mind—this too would be comforting for you. This is the time of the month to do it—it will feel great to say it like it is! You may feel inclined to make phone calls and answer Emails and connections with neighbors or siblings would be gratifying at this time. Personal Note: My curiosity involved something more or less physical—I wondered if I could start jogging but the Moon was right on top of Mars and it activated my inner warrior who wanted to “Run, Forrest, Run”. [Quote from movie: Forrest Gump/Tom Hanks] Also, I did communicate via Email at length with several students. I’ll also mention that I did receive more than usual amount of Emails from people asking about the psychic class. Also, I felt very drawn to go to the library several times as the Luna ran through my 3rd house, but just never made it there. If I had, I’d have really enjoyed it or the Moon would have supported that emotionally. Then again, I’m always happy at the Library. A reason for that is that my birth Mercury, ruler of the 3rd is IN the 3rd–so library ‘stuff’ is strong with me anyway, all the time. See how this works? I hope my sharing my own lunar transits are helpful to the reader and that my posts of the Moon’s monthly movement through the houses are helpful and have piqued the reader’s interest in the valuable subject of astrology. It is, in my opinion, such a valuable thing to know to aid in self-understanding but also in understanding others and working in harmony with them. The Moon is currently in my 4th house for the next day or so… but that’s for the next blog post. Yay! I’ve now caught up with my own Moon!